Wokingham Housing (WHL) has just completed the final site clearance work on behalf of Wokingham Borough Council (WBC) at the old Woodley Age Concern site at Southlake Crescent, Woodley. This consisted of demolishing the old day care centre, followed up by the removal of trees and shrubs on the site. WHL are currently finalising options for developing this site to make the best use of the land and further proposals will be submitted to WBC to provide much needed social and affordable housing in this area. As part of the site appraisal process WHL has instructed a comprehensive tree survey of the existing trees on the site. The surveys showed that the trees were of moderate condition, but unfortunately diseased and therefore had limited lifespans. After consultation with the planning and environmental teams the decision was made that the trees would be removed as part of an overall site clearance programme rather than at an inevitable later date. As you can imagine local residents were sad and disappointed to see the removal of the trees that we needed to take down. WHL strives to keep the impact of any development on the surrounding landscape to a minimum. We are fully committed as a result of having had to remove the trees, to ensuring that any new development has a replacement tree planting requirement that will introduce better species of trees for future generations to enjoy. The Chairman of WHL, Alistair Auty added “WHL are committed to the delivery of affordable housing for residents within the Borough. 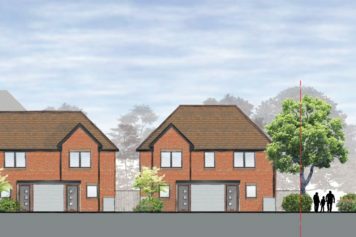 We are proposing to submit a planning application for a new development of 12-14 high quality affordable homes, which are much needed within Woodley. Full landscaping and new trees will be incorporated into this design to mitigate the loss of the existing trees”.